Researchers at The University of Manchester have developed the world's first handheld SORS device that can detect fake spirits, such as vodka and whisky, whilst still in their bottles. SORS, or 'spatially offset Raman spectroscopy," devices give highly accurate chemical analysis of objects and contents beneath concealing surfaces, such as glass bottles. It works by using 'an optical approach' where lasers are directed through the glass, enabling the isolation of chemically-rich information that is held within the spirits. Such devices are already commercially available but are usually used for security and hazmat detection, screening and pharmaceutical analysis. This latest version, developed at the University's School of Chemistry in the Manchester Institute of Biotechnology (MIB), is the first time such a handheld tool is being used for a food or beverage product. The reseach has been published in Nature today (21st September). Spirit drinks are the EU's biggest agri-food export, with EU governments' revenues of at least €23 billion in excise duties and VAT, and approximately 1 million jobs linked to the production, distribution and sale of spirit drinks. Professor Roy Goodacre, from MIB who led the research, says: "Food and beverage counterfeiting comes with the very real potential for serious health, economic and social consequences, especially when it comes to alcohol products. An essential part of ensuring consumer confidence is to provide assurance that these products are authentic and have not been either contaminated or counterfeited." Fake booze can also have massive implications for the health of its drinkers. Counterfeit goods do not follow the same stringent health and safety procedures major brands are forced to comply with by EU law. Therefore, counterfeit spirits often contain dangerous levels of methanol, a chemical used in antifreeze, which can cause sore throats, dizziness, sickness and even blindness. Dr David Ellis, who co-authored the project, added: "Sales of illicit spirit drinks can also have serious health impacts when industrial alcohols or methanol are used by counterfeiters and unknowingly consumed, with multiple deaths reported worldwide each year. That is why we have developed this approach, not only to ensure brand authenticity, but also to safeguard public health." 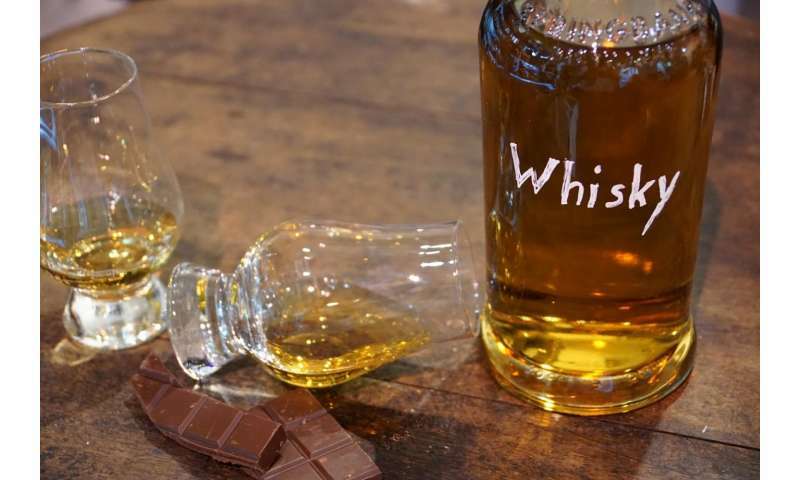 The team tested the gadget on around 150 well-known brands of Scotch Whisky, rum, gin and vodka in closed glass containers, including 40 counterfeit products. As well as detecting the contents of fake alcohol, the researchers could also discriminate between multiple well-known Scotch Whisky brands and detect different levels of alcohol. The team also tested the device on several bottles of spirit drinks bought 'off the shelf' from local shops. These were first measured unopened, then opened and contaminated with different levels of methanol (1, 2 and 3 %) and the tops replaced. The Handheld SORS still detected the contamination with methanol through multiple colours (clear/brown/green) of glass bottles in several types of spirit drinks including Scotch Whisky, gin, and vodka. What about "contamination" with artificial flavours and colouring agents? G, good question. I think we need to consider the motivations of those proposing the standards to be enforced. An important clue..."Spirit drinks are the EU's biggest agri-food export, with EU governments' revenues of at least €23 billion in excise duties and VAT, and approximately 1 million jobs linked to the production, distribution and sale"
"My Company's products are made to the finest health standards. My competitors products are poisonous swill unfit for human consumption!" It is my observation of "My Fellow Americans" that they only appreciate three flavors. Sugar, salt and the inside of a refrigerator! Example, confusing lite-beer with beer is like confusing tofu with beefsteak. Yeah, it can be done, and legally I'm afraid. Did any consumers specifically request the bogus products? Or, were they indoctrinated to endure such travesty's of malignant profiteering through mass-marketing advertisements and publicity gimmicks? The point of light lagers is that they're inoffensive for being bland and low alcohol so you can drink just to drink. Before the modern lite-beer there were small ales that served the same point. Not everybody likes to get s-itfaced on a dobbelbock every time they fancy a pint. Maybe one of the most effective ways to combat the fake markets is to mass serialise the original goods and empower the customers to check the originality and other product's characteristics. Serialization is maybe the most powerful and cost effective anti-counterfeit solution, for example the solution offered by my-validactor.com is immediately available, easy to implement and at a cost near to zero. Fighting counterfeiters could be an easy task if there is real willingness to combat them. So E, if I correctly understand your opinion, I should drink piss because it's healthier for me than a stout ale?